Vlad Guerrero Jr. wants to be the best player he can when he steps onto the baseball field each day. Turns out that dedication translates to the ice, too. Guerrero tried his hand at curling earlier this week with some of his minor-league teammates at the Leaside Curling Club in Toronto. 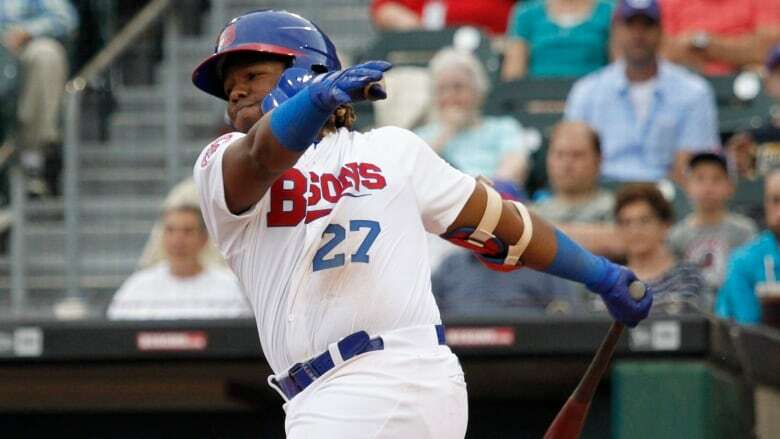 Vlad Guerrero Jr. wants to be the best player he can when he steps onto the baseball field each day. Turns out that dedication translates to the ice, too. Guerrero, the Blue Jays top prospect who tore through double-A and triple-A pitching last season, tried his hand at curling earlier this week with some of his minor-league teammates at the Leaside Curling Club in Toronto. "It was difficult, it was difficult," he said with a smile when asked about the experience. "It was really hard at first but like anything when you work hard and you pay attention, you get better," Guerrero continued through translator Tanya Bialostozky, a mental performance coach with the team. "I tried and I tried and towards the end I was able to make some good plays." Guerrero was in Toronto this week as part of the Blue Jays' Winter Fest, where fans gathered to interact with players on a Rogers Centre field that was transformed into a carnival atmosphere, complete with a Ferris wheel, carousel, bouncy castle and skating rink. Born in Montreal — when his Hall of Fame father Vlad Guerrero played for the Expos — but raised in the Dominican Republic, the 19-year-old Guerrero has been embracing the affection he's already been shown by Toronto fans eager for his major league debut. He hasn't seen much of the city quite yet though. "It's been too cold and I haven't really left the hotel," Guerrero said as snow whipped through the sky outside the stadium on a blistering cold morning. "But in terms of seeing people with my [jersey] I feel really proud and very happy and it makes me want to work harder." Guerrero batted .336 through 30 games at triple-A Buffalo in 2018 after hitting an electrifying .402 at double-A New Hampshire to start the year. The stud third baseman is only one of a handful of young Blue Jays players who appear on the cusp of breaking out in the big leagues, however. Shortstop Bo Bichette is also waiting in the wings after a stellar season at double-A while catcher Danny Jansen, left-hander Ryan Borucki and infielder Lourdes Gurriel Jr. showed glimpses of their potential in Toronto in 2018. While manager Charlie Montoyo is hoping for big seasons out of all his young stars, Guerrero is the one expected to be the cornerstone of the new-look Blue Jays for years to come. There are lofty expectations on Guerrero, who won't turn 20 until March, but Gurriel doesn't think his young teammate will have a problem managing the hype surrounding him. "He's always had a lot of attention so he's good at managing it," Gurriel said through the translator. "He also doesn't pay attention to everything that's going on around him. All he cares about is his play so that will probably be very easy for him to stay calm and do a great job." "I had the opportunity to play with Vladdy in double-A and I'm looking forward to [his debut]," the 25-year-old Cuban added. "When he's with the team it will be good for everybody because he's just a great guy to be around."